Copyright: © 2017 Buzayan MM. This is an open-access article distributed under the terms of the Creative Commons Attribution License, which permits unrestricted use, distribution, and reproduction in any medium, provided the original author and source are credited. The One of the most challenging dental management is the oral rehabilitation of cases with an edentulous maxilla opposed by remaining natural mandibular anterior teeth. Several potential problems may arise and face the prosthodontist while managing such a case, some of these problems are; bone loss from the anterior region of the maxillary jaw, maxillary flabby ridge formation, and overeruption of unopposed mandibular anterior teeth. Kelly in 1972 was the first to coin the term combination syndrome for this oral condition and its associated clinical features . The definition of the combination syndrome according to the Glossary of Prosthodontic Terms is; the characteristic features that occur when an edentulous maxillae is opposed by natural mandibular anterior teeth and a mandibular bilateral extension-base removable partial denture, including loss of bone from the anterior portion of the maxillary ridge, hyperplasia of the tuberosities, papillary hyperplasia of the hard palate’sprosth mucosa, supra-eruption of the mandibular anterior teeth, and loss of alveolar bone and ridge height beneath the mandibular removable partial denture base, also it has another name like anterior hyperfunction syndrome . In 1979 the range of signs and symptoms that are characterizing the combination syndrome was extended and more features have been added including the vertical dimension of occlusion loss, papillary hyperplasia, discrepancy of the occlusal plane, occurrence of epulis fissuratu, and the periodontal changes of the remaining natural teeth [3,4]. The success of the prosthetic rehabilitation in such patients depends on the achievement of stability, retention and proper support for the prosthesis to interfere with the combination syndrome mechanism and associated major causative factors like; the great magnitude of forces, the unsuitability of the denture foundation, and particularly the unfavourable occlusal contact produced by the remaining natural teeth. In addition to that, the proper use of the prostheses in the masticatory process is also a crucial factor [1,2,5]. A 73 years old woman attended to Prosthetic Department, requested for new upper and lower prostheses. She had a history of very loose upper and lower dentures. Intraoral examination showed that she was completely edentulous on the upper arch, with moderate bone resorption. The tuberosities were both enlarged, and she was partially dentate on the lower arch with spacing and over erupted remaining anterior teeth, 31, 32, 41 and 42. The vitality of the remaining teeth was evaluated using the electrical pulp test (EPT), and it was found that the remaining anterior teeth were non-vital. On radio-graphical examination, the findings were thick mucosa covering the tuberosities, the root canals of the remaining teeth were obliterated. The treatment plan was decided to fabricate a metal reinforced maxillary complete denture and metal reinforced mandibular overdenture utilizing 32, 31, 41, and 42 as long coping (thimble) abutments (Figures 1 and 2). Figure 1: Intraoral view of the upper and the lower jaws. Figure 2: Dental panoramic radiograph shows thick mucosa covering the tuberosities, the arrows (left), Periapical radiograph shows that the root canal system of the remaining mandibular anterior was obliterated (right). Evaluation of the space availability and preparation of 32, 31, 41 and 42 to receive metal copings: Primary impressions of the maxillary and mandibular arches were taken with alginate impression material (Kromopan, Lascod, Illinois, USA). Both impressions were disinfected and poured to produce study casts. Another impression of the current maxillary prosthesis was made using alginate and poured to produce opposing cast to articulate against the lower study cast. In the same visit, an initial maxilla-mandibular relationship was recorded. This was done to evaluate the available space for the planned long coping (thimble) abutments. Study casts were mounted on a semi-adjustable articulator (Protar 7, Kavo). The lower anterior teeth were prepared on the cast to simulate the assumed size of the planned long coping. 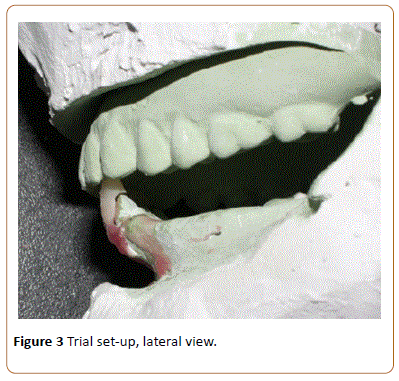 A trial setting of artificial acrylic teeth was done to assess the available space (Figure 3). Figure 3: Trial set-up, lateral view. After confirming that there would be enough space for the planned type of the overdenture abutments, teeth preparation of 42, 41, 31 and 32 was carried out to receive metal coping, providing more reduction on the labial surface of the teeth (Figure 4). Subsequently, secondary impression of the preparation was taken with addition silicon medium body (Aquasil ultra monophase, Dentsply) using a spaced custom tray. 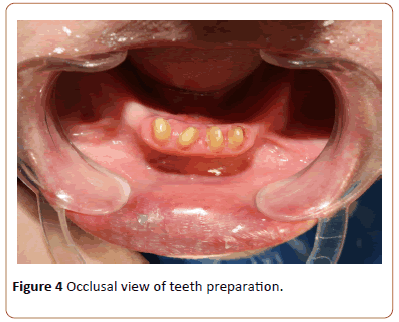 Figure 4: Occlusal view of teeth preparation. Construction of an interim overdenture using the existing lower prosthesis: The current lower removable partial denture was picked up with an alginate impression (Figure 5), and poured in stone, to modify it into interim overdenture by adding artificial acrylic teeth to it. And it was issued to the patient on the same day of the teeth preparation (Figure 6). Figure 5: Occlusal view, metal copings cemented (left). 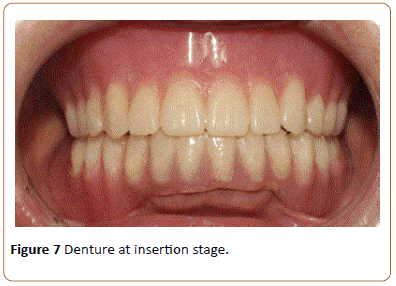 The adjusted interim overdenture (right). Figure 6: Current RPD was picked up with an alginate impression (left), the interim overdenture in place(right). Cementation of the long metal copings: The metal coping was tried on the teeth and cemented permanently using Poly F cement (Dentsply, Germany). Subsequently, the intaglio surface of the interim overdenture was adjusted to remove any interference with the cemented copings (Figure 6). Using a spaced custom tray new secondary impression were made for the lower and upper arches using addition silicone medium body (Examix, GC, USA). Issuing the final prostheses: The conventional way of the metal reinforced removable prostheses construction and fabrication was followed. At insertion stage, the intaglio surface of the mandibular overdenture around the abutments was relined using side-chair hard relining material (KOOLINERTM Hard Denture Reline Material, GC, USA) to increase the intimate contact between the prostheses and the abutments (Figures 7 and 8). Figure 7: Denture at insertion stage. Figure 8: The finished prostheses (left) The intaglio surface of the lower overdenture (right). In 1972, Kelly coined the progressive destructive changes in the hard and soft tissues of the oral cavity seen in cases characterized by a completely edentulous maxillary arch opposing a natural mandibular anterior as Combination syndrome. Prosthodontic management included a careful preventive and restorative management planning that requires a multi-disciplinary approach, this approach may further include preprosthetic surgical procedures like flabby ridge excision, vestibuloplasty as a management for compromised sulcus depth and teeth extractions [1,2,5-8]. For the maxillary arch, these preprosthetic managements can be followed by either; 1-implant-supported fixed denture prosthesis, 2-implant supported over dentures, or 3-metal reinforced maxillary complete denture. The treatment option eventually depends on the patient desire, his oral condition, the length of the required time and economic factor [5,6]. Choice of the treatment plan for the presented case in this article is made by taking into consideration the retention and stability of the prosthesis along with prevention of the progressive destructive changes and the preservation of the current oral tissues health. This case report illustrates the management of patient presented with a completely edentulous maxillary arch, with a large torus palatinus and enlarged tuberosities. The mandibular arch was partially dentate with remaining anterior teeth, 31, 32, 41 and 42. The mandibular remaining teeth were flared, supra erupted, spaced and they lost some of their bone support. Hence, the decision was made to prepare the teeth as overdenture abutments, to improve their crown: root ratio and increase their stability [8,9]. Apart from the bone support loss, the general periodontal health of the remaining teeth was good, therefore, the metal long coping (thimble) overdenture abutment type was chosen. By providing the prepared teeth with these copings, the remaining teeth structure is protected, and the mandibular prosthesis' retention and stability were enhanced [8,9]. Both the maxillary complete denture and the mandibular overdenture were reinforced with metal to increase the prostheses strength and to reduce the denture fracture possibility, especially for the maxillary arch [5-8]. Using this approach in the management of the combination syndrome, will increase the stability, retention, and will provide better support for the prostheses, this, in turn, will interfere with the combination syndrome mechanism and prevent further destructive changes from occurring, and yet this approach is considered economic. And although, it would be much better to place dental implants and to provide the patient with dental implant retained prostheses restoring the upper and the lower missing teeth, however, that depends on multiple factors like the bone availability, patient general health, and financial factor. The prosthodontist should carefully plan the management of such patients in order to preserve the health of the oral tissues and provide them with a functioning prosthesis that reduces the chance for the combination syndrome to occur. Hence, thorough diagnosis, proper treatment planning and accurate execution of that plan will result in an exceptional outcome. Glossary of prosthodontic terms (2005) J ProsthetDent 94: 10-92. Kelly E (1972) Changes caused by a mandibular removable partial denture opposing a maxillary complete denture. J Prosthet Dent 27: 140-150. Saunders TR, Gillis RE, Desjardins RP (1979) The maxillary complete denture opposing the mandibular bilateral distal-extension partial denture: treatment considerations. J Prosthet Dent 41: 124-128. Thiel C, Evans D, Burnett R (1996) Combination syndrome associated with a mandibular implant. The Journal of Prosthetic Dentistry 75: 107-113. Sigvard Palmqvist, Gunnar E Carlsson, Bengt wall (2003) Combination syndrome: A literature review. 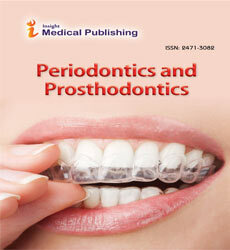 Journal of Prosthetic Dentistry 90(3): 270-275. Sridharan Rajendran, Baburajan (2012) Combination Syndrome. International Journal of Prosthodontics and Restorative Dentistry 2(4): 156-160. Nadgere Jyoti, Nisargi Shah, Mallika.M. Karthi (2010) Prosthodontic Rehabilitation of patients with Combination Syndrome. Int J Dent Clin 2(3): 37-44. Zarb Bolender (2004) Prosthodontic treatment for edentulous patients. Complete denture and implant -supported prostheses. Mosby. Preiskel, Harold W (1996) Overdentures Made Easy: A Guide to Implant and Root Supported Prostheses. Quintessence.